Star Hopper is one decided pony. Straightforward and decisive, she knows where she's going and where everypony else should as well. She's always full of energy, sometimes a bit too much. She tends to act as a know-it-all, but it is always with the best of intents and she'll listen to reason when she gets too far. Star Hopper was available in two color schemes, and I chose the one that I had as a young girl, aka golden mane with darker body, as opposed to the mail order version that came with a pale body and white mane. I gave her an extravagant and sharp haircut to match her character. Her cutie mark was an UFO (wtf?) so I decided to switch it to a Saturn-like planet and moons, mini mark matching the cutie mark. I imagine her as an astronomer of some sorts. Sky Rocket is the dreamer. Always fiddling in her workshop, sh'es a great inventor and keeps thinking of new devices and machines to make life better. She loves to have fun and delights in seeing other ponies enjoy her craft. She holes up in her work, sometimes, and someone usually has to fetch her and remind her to grab some food and get some air, as well as hang out with her friends! Color wise, she inherited the pink and blue colors from Sky Dancer, and I love the pink tinsel in her mane. She's the second pony to be accessorized, and her mane and tail feature some lovely braids. Cutie mark is a rocket (think of the firework types of rockets) and mini mark is a bolt, to match her craft. Napper proved to be quite a challenge. She might be up to some changes, I'm not too sure... I chose the yellow body/green mane version, but I'm not too sure if the yellow body/lavender mane wouldn't be better. Her side view and front view could be a lot better too, so I might revisit the design. Character-wise, she's a lazy, quiet girl, always dozing off. She'll always go for the easy solution, and she prefers to avoid making efforts. She's very cuddly and affectionate, and loves good food, although she prefers it when others cook! 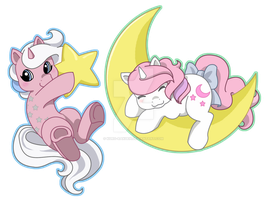 Cutie mark is a sleeping moon with clouds, and mini mark features a moon crescent with shadow, somewhat similar to a closed eye. Coming next : Sparkle Fillies! you should work for my little pony! love napper and star hopper here! Ooh! Good job with the sparkling effect. It looks great! Oh! This is amazing. I love the expressiveness you've given to them, wow. and your designs are amazing! Haha, it's so funny how your version of Star Hopper is so different from *IntroducingEmy's here [link] they're both amazing! Thanks for the link, I hadn't seen that version! She's really amazingly CUTE! Again, these are so cute!!! I adore your style!!!! Can't wait to see the fillies! Ah ah! That's really funny, 'cause she turned out blue and pink because I had given her colors to Sky Dancer, who is the coal of the gang, because green and red was more boyish. I guess you can feel the boy-vague emitting from this pink and red, as I did try to make it fit for a coal for quite a while. The fillies will be soooooooo adorable. Don't know how I'll make it through such waves of cuteness attacks! You've made them look so cute and pretty. Well done. I love Star Hopper's bottom-center expression.